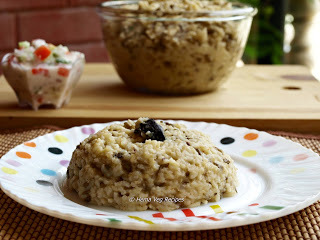 Bisi Bele Bath is famous rice based dish from South Karnataka. While you can get off-the-shelf Bisi Bele Bath powders in grocery stores, the recipe that I am presenting here involves starting from scratch. If you are in a hurry, you can skip Step two below, leave out frying ingredients and use commonly available Bisi Bele Bath powders including the popular MTR one available in stores or follow my Bisi Bele Bath Powder Recipe. 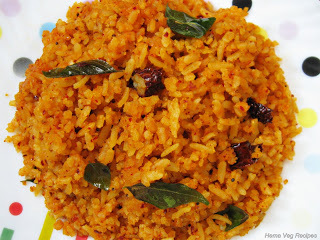 This rice dish can be had for breakfast or for lunch. It is best served with spicy Potato Chips. 1) Cut all vegetables except onions. If you purchase dry peas, keep them soaked for at least 12 hours before use. Cook Rice, Toor Dal and Vegetables (including peas, except Onions) in 3 separate vessels in a pressure cooker. Add Jaggery and a little Salt to the vessel containing vegetables before cooking. This enables the cut vegetables to absorb a little of the sweet and salt taste while being cooked in the pressure cooker. 2) Optional – Cut onions length wise (like you would for say onion pokada). 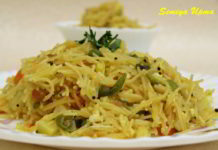 Take 1 tsp Ghee with cut onions in a frying pan and fry onions until they turn golden brown. Keep this aside. This step can be skipped and you may use Bisi Bele Bath powder available in the store instead of these fried ingredients to prepare the smooth coconut based paste in the next step but you may not get the same original taste with the ready-made powder mix available in the stores. Again, you may follow my recipe for Bisi Bele Bath Powder for better results. Heat oil in a frying pan. Add Bengal Gram, Urad Dal, Dhaniya, Jeera, Cloves, Cardamom, Cinnamon, Red Chillies and fry until these fried ingredients change color. Take grated Coconut in a mixer jar. Pour above fried ingredients or the Bisi Bele Bath Powder into the jar. Add a little water and grind well in the mixer grinder until you obtain a smooth coconut based paste. 1) Take Tamarind paste in a kadai. Boil it for a minute. Then add the smooth coconut based masala paste from step 3 above. Add a little water and allow the contents to boil for about 3 min. 2) Add cooked vegetables, Dal and Rice. Add Salt as per taste with a little Jaggery and boil the mixture for 5 minutes while you keep stirring continuously with a ladle to avoid the bottom contents from getting burnt. You may add additional water if you feel the contents are a bit thick. Add fried onions from step 1 above to the Bisi Bele bath mixture above and stir well to help the onions to mix well. Take 1 tsp Ghee in tempering or Oggarane pan. Add Mustard seeds. Once the seeds splutter, add Urad Dal, Bengal Gram and cut Red Chillies and fry until the Dal turns golden brown. Add this tempered mix to the Bisi Bele bath preparation from step 7 above and mix it all well with ladle. Now Bisi Bele bath is ready to serve. 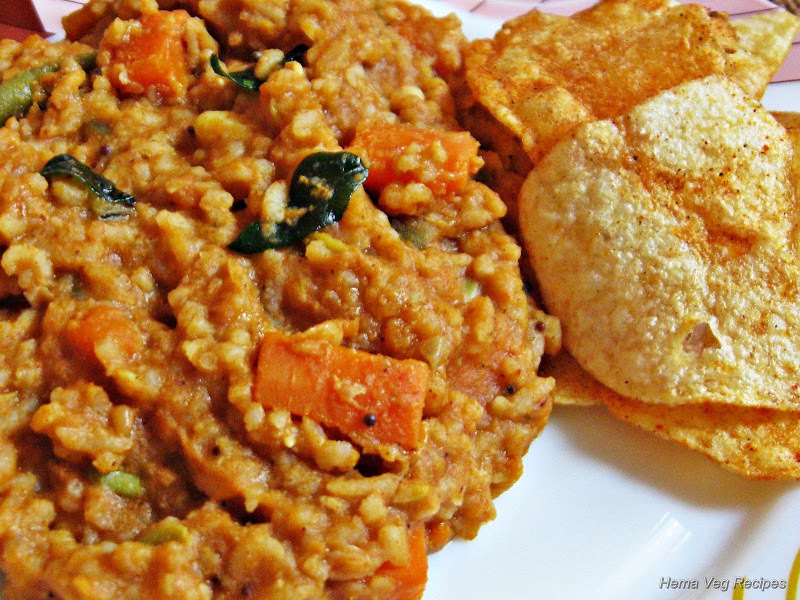 The Bisi Bele bath tastes best with fresh Potato Chips or with Khara Boondi. 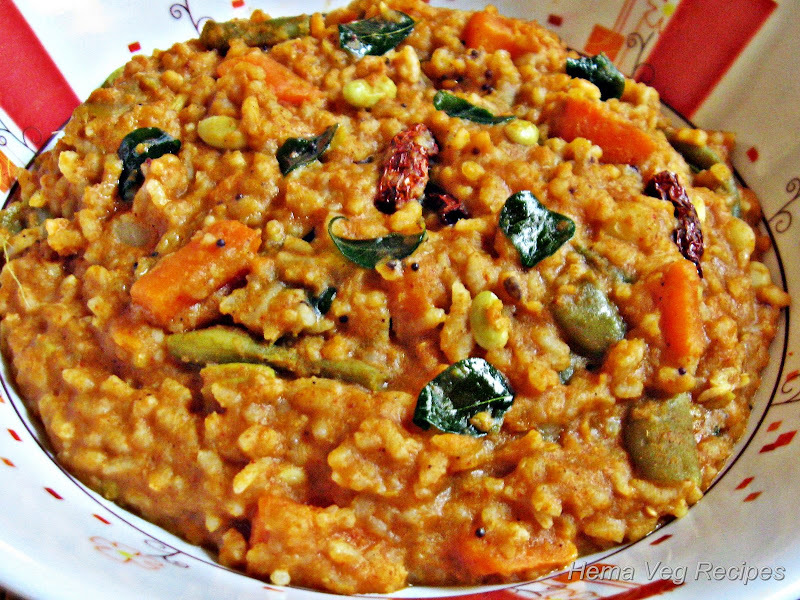 Priya – Thanks for pointing out the omission of Red Chillies in Bisi Bele Bath recipe. That was a big miss! Coming up with great tasting Bisi Bele Bath can be a bit tricky and it can happen even with some of us who have good amount of experience. Happy to hear that it came out well for you. Thanks a lot for this wonderful detailed recipe. Apparently, after living in Bangalore for more than 23 yrs, BisiBele Bath happens to be my favorite dish. I tried it today with this recipe and it came out really well. Thanks again! The recipes are mouth watering, good work. Please post some instant recipes which can be prepared with min. ingredients. Tired of eating pizza and burgers. Good Job with the recipes. Was going through the bisi bele bhaat recipe. I feel we need to add fenugreek seeds in the powdered masala and asafoetida (hing) in the tempering. Maybe you could add those in your recipe. i’m newly married person n self cooking, i don’t know how to make different recipes , i’m very thankful to u for posting of different recipes. All your recipes are too good. Bisibele bhath (BBB) is my favourite. Your BBB from the picture looks yummy. I tried to follow your recipe but could not get the same colour as yours though i used the same quantity of red chillies as you have mentioned. Is there anything that I might have missed? I could manage to prepare very very delicious Bisi bele Bhat as Sunday feast n trust me it came so well that my son had it thrice a day. I followed you word by word n m so happy with my achievement. Thank you so much for sharing the easiest recipes with us. I guess you have missed the recipe of Tamarind rice / Imli Chawal. Although i make it every now n then but m sure there would be some specialty in yours. N ya i want to know the tamarind rice powder recipe as well. Please share the same as n when it is possible for you. I followed the procedure you have given and got the delicious Bisi bela bath…Thanks for your help and keep it up..!!! I really thank you very much. My wife was out of town today and my sons was adamant, that they wanted Bisi bele bath. Lo here I go to the internet and follow the instructions given by you, and my sons were so happy that they asked me to cook every day :). Hi really thankful for this receipe. It’s my favorite food . I tried too nice and superb taste . Your recipes are good. 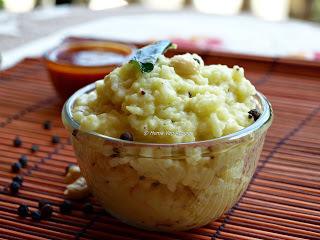 I am also Bangalorean, and currently I am staying in Chennai, my in-laws dont like spices like cinnamon, can I make Bisi Bele Bath without that??? I love Bisi Bele Bath very much but I can’t prepare here I think. 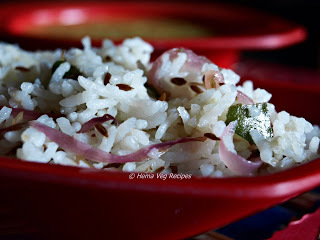 I love MTR Bisi Bele Bath and i am one big BBB freak.This is the best BBB recipe i have ever read. Thanks a lot for the post.Your other recipes are also suuuper nice…suuuuper nice job…keep up the goood work..i am very happy with ur blog. This is Muskan from Bangalore. 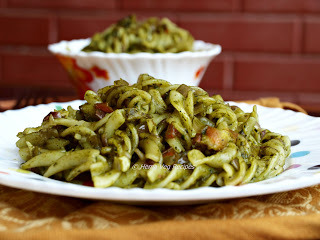 I am newly married and I don’t know to cook but you helped me from this recipe Thank you so much. As far as i know, while preparing BBB, rice, dal, veggies are cooked together. Not seperately. The recipe is wrong is guess. This is aruna. I’m following some of your recipe got happy in cooking. 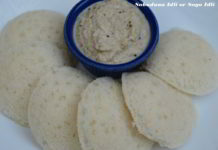 Plz can we get lists variety of chutneys for roti chapati and parata, dosa, idli, gundapnglu(paddu). It will be most exciting one. Thank you. Today I saw the BBB receipe.I have one question.instead of cooking veg., day, and rice seperately in cooker why can’t we cook everything in the sa me cooker.my mil does that.plan.do clarify. Hi Hema, I am a new cook! When we pressure cook the vegetables and dal and rice…how much water should we add to each of the vessels. How thick should that dal be once cooked? Your recipe is wonderful. As mentioned by others, you should add turmeric and roasted methi seeds while preparing the powder. Also you should add 1/2 tsp jakaai powder, 1 small piece of chakra moggu to enhance the aroma. I prepared bisi-bele-bath today just by following your recipe and steps it came very tasty and yummy…thanks a lot for the recipe..